In a world brimming with controversies around race, gender, and sexual orientation, there seems to be an abundance of noise without real dialogue or progress. Into that situation, Kathy Khang brings optimism and insight, urging fellow Christians to speak up for marginalized people and to do it well. Her unshakeable position is that God cares for everyone and hears every voice, and that Christians should do the same. The voices of individual Christians and faith communities are just what the world desperately needs to set things right and help bring the justice God designed, the book assures its readership. Those voices—each one part of a person created in the image of God—bring God’s love and justice into the messy world and to the people who are trampled down in it. The book begins with Khang’s personal story of risk taking and voice raising—as an Asian American, as a woman, as a journalist, as a mother, and in so many other elements of her identity. This model of starting with the personal runs powerfully counter to the modern mode of throwing out accusations in impersonal online settings. From there, Khang shows people how to hear God’s call to speak, how to dispel their fear, and how to converse well with others in a public sphere. The book is well organized, moving from silence to speaking and addressing the roadblocks along the way. Khang’s voice is warm and assertive, filled with heartfelt honesty and humility. Her background as a journalist shows up in deft writing that harnesses narrative scenes, research, scriptures, and clear instruction. For those too comfortable to sit in silence, the book shows that, yes, speaking up is risky, but it’s profoundly worth the risk. For those who relish debate and controversy, the book shows them how to pause, consider, and use words to their greatest effect. 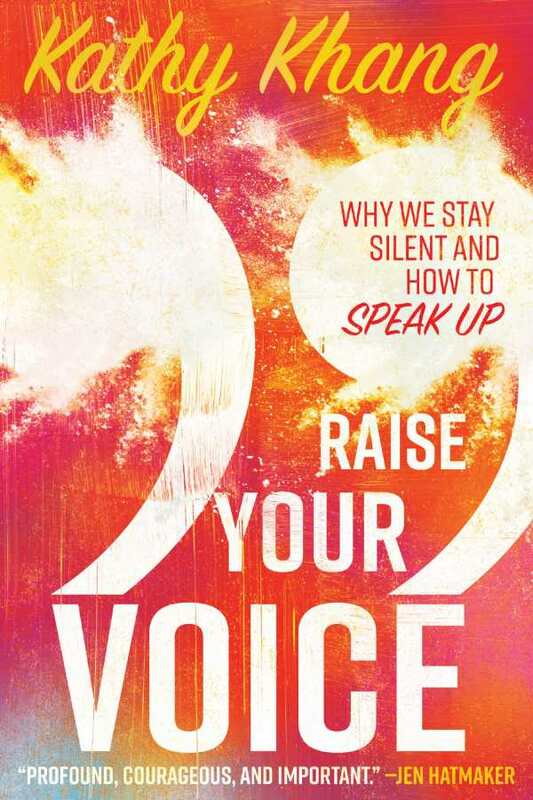 Raise Your Voice is the prompt that Christians need to encourage and equip them to speak up for justice and hope.